V4 specialises in hardwood floor coverings sourced from around the world to offer consumers the opportunity to bring a touch of nature indoors. V4 pride themselves with a range of Engineered Wood Planks, some of which have Solid Hardwood Wear Layers that are produced with fast growing spruce, poplar and birch wood trees. This process means the yield from a single tree is increased by up to 60%, which results in less slow growing trees being used and therefore is considerably more environmentally friendly. Appearance- Who doesn't love the elegant look of a real wood floor? 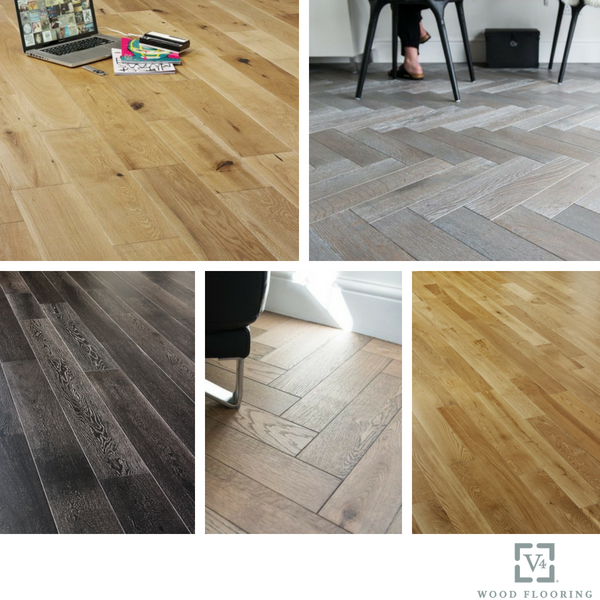 With many colours, shapes and sizes available in the range, V4 products are some of the finest planks on the market today. Durability- All V4 wood floors are constructed with multiple hard wearing layers that are backed by a 35 year residential guarantee. Easy To Clean- Due to Hardwood floor-coverings being solid and not containing fibres like carpets they are very easy to clean, many incidents can simply be brushed, mopped and vacuumed away. Easy To Change- Redecorating your home and feel like the floor needs changing too? Well with V4 wood floors, many can be sanded down and re-finished or varnished to an alternative colour, the options really are endless. Hygienic- Unlike carpets that can harbour dust which can be terrible for allergy sufferers, hardwood floors eliminate this and are also more beneficial in homes with Dogs and Cats.